BBC Sport at Parc des Princes, Paris. It may not quite have been Paris in the springtime, but there was no shortage of romance in the night air. 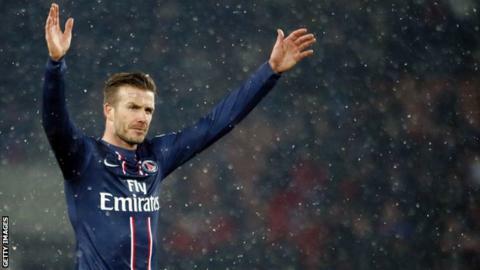 It had been almost a month since David Beckham and Paris St-Germain fell into each other's arms, but it was not until late on Sunday night that the mutual infatuation was consummated under the lights at a bitterly cold Parc des Princes. Beckham's arrival was beautifully staged, coinciding as it did with the biggest match in France's domestic season: Paris versus Marseille, first against third. It was Le Classique in every sense. Coming off the bench in the 76th minute, the 37-year-old Beckham played a part in Zlatan Ibrahimovic's goal for Paris St-Germain to cement a win that could prove crucial in their title bid. Added to that sense of theatre was the presence of Joey Barton in the visiting line-up, prompting France Football Magazine to bill the confrontation as "ange et demon". Many in Paris have been swooning since Beckham arrived and announced he would be donating his five-month salary to a children's charity in the city. That move disarmed many of his critics and won over much, if not all, of France. But on Sunday, Paris ground to a halt to see if, even at the age of 37, Le Spice Boy could still do it on the field. Disappointingly, there was no truth to the rumour that he had arrived at Parc des Princes having powered along the Seine, standing up in a speedboat, but his introduction was still dramatic, as he was thrown on with 16 minutes of a tumultuous encounter remaining and the outcome very much in the balance. The brand plays on and yet, by eschewing lucrative moves to China, Australia and the Middle East to return to Europe Beckham had shown that he still has ambitions to prove himself. His first two passes, low, drilled efforts both, found their target to the delight of the 45,000 inside the stadium, while, in the company of players such as Ezequiel Lavezzi and Zlatan Ibrahimovic, there was enough to suggest this is a man able to prove a point to his critics. From his deep-lying midfield role, there were fierce challenges, orders barked at team-mates and even a charge down the right wing, reminiscent of days of old. The crucial contribution came in stoppage time, when Beckham found Jeremy Menez with a delicate pass, flicked with the outside of his right-boot, and the France striker cut the ball across goal for Ibrahimovic to make it 2-0. It was a winning debut and one that proved PSG manager Carlo Ancelotti, far from being burdened by a marketing tool, believes in Beckham's value to the team, even in the most heated and important of matches. Paris now lead Olympique Lyonnais by three points at the top of Ligue 1 as they seek a first title since 1994. Victory would give Beckham the honour of being the only Englishman to win league titles in four countries. Even before he had kicked a ball in anger, he was dominating the French news headlines. Le Parisien called the occasion, "Un match pas comme les autres" - a match like no other - and devoted the first four pages to Beckham. The streets of Paris have also been abuzz with his name. Valerie DeVries, 45, was standing on the Champs-Elysees when she spoke to me having just bought her 13-year-old son a Paris shirt with Beckham's name on the back. Even at £73 they are flying off the shelves all over Paris. "There are people who are cynical," she said. "I just know he is a footballer my son can look up to. And there aren't too many of them." Overhearing the conversation, Henri LeRaten, 63, stopped to disagree. "Don't be fooled." he said. "This is about money and fame. It is not about football. PSG have bought a money-making machine. Don't be confused between that and a footballer." Beckham's life is now a tale of two cities. His wife has stayed at home in London, where the children are being educated, though Victoria and the four children spent much of the past half-term week in Paris. There was a fascination in the gossip pages and the inevitable frenzy among the paparazzi as the family toured the city's sites and restaurants. Beckham calls the Imperial Suite at Le Bristol hotel home these days. The five-star residence on the chic Faubourg Saint-Honore has it all. For starters, there is the three Michelin starred restaurant, which serves such delicacies as pot au feu with black truffles for 110 euros (£96). But he also has a chauffeur, bodyguards and a personal assistant provided by John Paul, the up-market concierge, who secured a discount on the suite's normal rate of £14,800 a night. "I am glad he came to Paris," says Marie Laurens, 22. "He's older now, but look how popular he is. PSG is being talked about all over the world and that is because of him." "Beckham is more equal than others," was how the newspaper Le Monde put it. "Like Best, without the booze, the genius of Gascoigne but with kindness and with the iron determination of Keegan, but warmer." Even Ancelotti has joined in. "I love Beckham," he said before the game. "I love him as a footballer and as a man." It can only be the briefest of flings, of course. But on this evidence, Beckham's spell in Paris promises to be an affair to remember.